Fancy walking around in a headband that could make you smarter? Yes please, we call cry! What may sound like a laughable fantasy could actually be a reality thanks to a new research project funded by DARPA. News has (1) emerged that the military in the United States are developing a device that increases learning capacities by an incredible 40%. Furthermore, the intelligence-enhancing headband could be commonly utilized by the year 2022. The device has been designed by researchers at HRL Laboratories and McGill University in Montreal. The project has been funded by the Defense Advance Research Project Agency (DARPA). The headband is described by its creators, as ‘non-invasive transcranial direct current stimulation’ (tDCS). The device works by applying a current to the prefrontal cortex area of the brain. The current creates fluctuations in the connectivity between the different areas of the brain, which heightens the learning capacity. Prior to the research, it was thought that increased learning can be created by a greater firing of neurons. However, the headband’s researchers dispute such claims, stipulating that it is a modulated connectivity between certain areas of the brain that causes an increase in the speed that we can learn. The study involved the headband being tested on macaque monkeys. The monkeys’ learning behaviour between visual stimulus and the location where a reward was given was analysed by the researchers. The study found that it would initially take the monkeys around 15 seconds to recall an item. However, when the monkeys had learned of the location of the reward, it would only take them two seconds to locate the item. Prior to undergoing iDCS treatment, the monkeys would take, on average, 22 attempts to locate the rewards. This contrasted significantly to the monkeys’ learning behaviour following tDCS treatment, in which they would learn of the rewards’ location after just 12 trials. Dr Praveen Pilly, the researches principle investigator, explained how the headband works. The HRL Laboratories and McGill University team of researchers hope their device will be approved by the FDA and believe such technology could be commonly used in as little as five to ten years’ time. 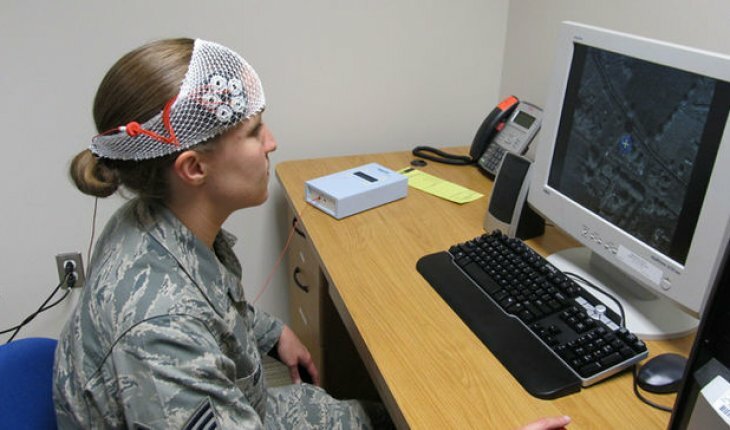 DARPA’s new headband designed to make us smarter, is the latest development in devices aimed at increasing military capacities. Earlier this year the (2) New York Post published a report about the US military developing technology to make soldiers smarter and faster. The US Army’s division of ‘super seals’ have their brains boosted to make them quicker, smarter and more responsive. Speaking at a military conference near Washington earlier this year, Rear Admiral Tim Szymanski, explained the different ways ‘cognitive enhancement’ could be carried out, including drugs and brain training. Szymanski said he is particularly interested in advances in electrical stimulation, which shocks the brain into faster response times. “In experiments, people who were watching these screens… their ability to concentrate would fall off in about 20 minutes,” Tim Szymanski told (3) Military.com. “But they did studies whereby a little bit of electrical stimulation was applied, and they were able to maintain the same peak performance for twenty hours,” added the admiral. In July this year, (4) Top Secret Writers published a report about CIA documents revealing years of abuse and psychological damage via mind control. The report related to declassified documents that show through the use of drugs, electric shock and hypnosis, operatives from the CIA had inflicted multiple personality disorder and other psychological damage on those participating in the experiments. The declassified documents show the shocking pitfalls of attempting to manipulate the mind and body. In the case of the research conducted by scientists at HRL Laboratories and McGill University in Montreal to develop and intelligence-enhancing headband to make humans smarter and quicker, it was only the poor macaque monkeys that were forced to undergo a cognitive development experiment. What are your thoughts on brain manipulation and attempts to heighten human intelligence for military gain? Unnatural and scary or an important part of military advancement?